As the summer continues to slip away from all of us, I thought this would be as good a time as any to update everyone about the doings in Rockford so far this offseason. Obviously, the moves Stan Bowman makes figure heavily into how the IceHogs roster could look come fall. There has been activity in Winnebago County that will factor into the mix, however. Several players have been signed to AHL deals. If you care to follow me into the rabbit hole, I’ll try and sort out who has come and gone since the past season came to a close. Peter Regin’s bags were packed for Jokerit of the KHL before the Hogs were eliminated from the Calder Cup Playoffs. Spencer Abbott signed with Frolunda in the Swedish Hockey League. Drew LeBlanc is also headed for Europe, specifically Germany. Cody Bass inked a two-way deal with Nashville, which likely means we’ll see him in town with the Milwaukee Admirals several times this upcoming season. Matt Carey also will be a familiar face in another AHL city. He joined the Iowa Wild on an AHL deal. Justin Holl, a former Hawks draftee who was on an AHL deal last season, signed an AHL deal with the Toronto Marlies. Antti Raanta, Stephen Johns and Alex Broadhurst were all part of the trade activity in Chicago earlier this summer. With the exceptions of Carey and Mac Carruth, who the Hawks cut luth…er…loose, all the remaining RFA’s were tendered offers. Aside from them and the aforementioned trade casualties, the rest of Chicago’s prospects are still in the fold. 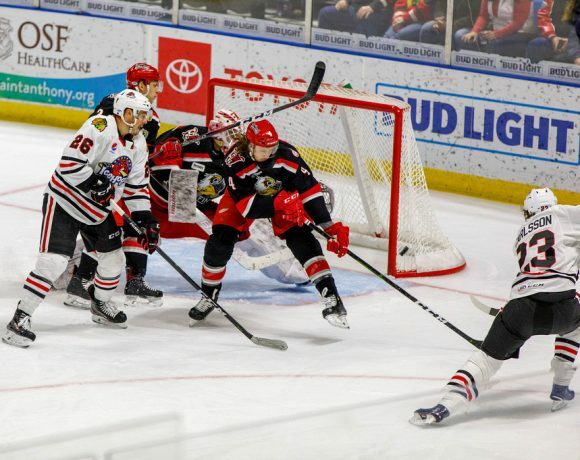 Let’s start with two veteran players returning for a second season with the IceHogs. In mid-June, Pierre-Cedric Labrie was signed to an AHL deal by Rockford. Labrie, who was on a two-way contract with the Hawks last season, was a player the fans took a shine to. As well as being personable, he also reportedly added a strong voice in the locker room. I figured Rockford was destined to be a blip on his much-traveled resume. Both sides must have felt Labrie was a good fit for the Hogs, though. Look for the big forward to provide that veteran presence. Also returning is team MVP Michael Leighton. 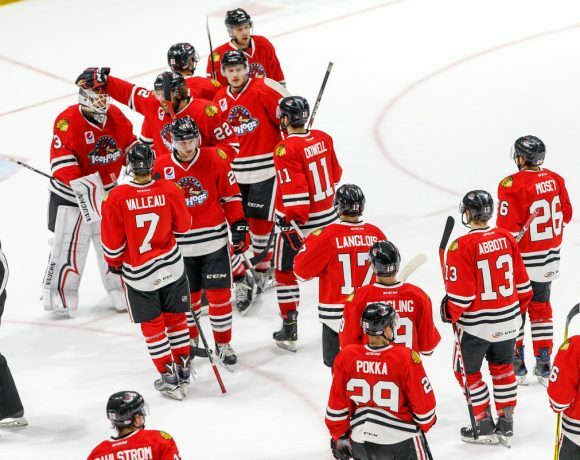 The 34-year-old goalie was the backbone of a strong IceHogs 2014-15 campaign. If the numbers reported are accurate, Leighton took a big cut in his AHL salary with the two-way contract he signed with Chicago. He made $400,000 while anchoring the crease for Rockford last season; his AHL salary will be $125,000 in 2015-16. Veteran Jason Labarbera, who was between the pipes in Rockford for part of the 2013-14 season, signed a two-way deal with the Flyers that includes an AHL salary of $250,000. Leighton’s numbers were decidedly a cut above Labarbera’s, as well as the bulk of AHL net minders. Staying in Rockford was obviously a priority for Leighton because money was not the driving force behind this choice. The Hogs have a player in net they can depend upon and Chicago gets an experienced NHL goalie who could come up in an emergency situation. Rockford also brought back some of their AHL signings. Defenseman Kirill Gotovets and forward Dane Walters were re-signed to AHL contracts. Depending on how the Bryan Bickell and Kris Versteeg yard sales progress the rest of the offseason, there are a lot of players who may well end up skating at the BMO Harris Bank Center in a few months. Chicago has a lot of inexpensive players who could either be depth for the Blackhawks or full-time IceHogs come fall. I will offer thoughts on that shakedown later this summer when I get it in my head to formally preview the upcoming season. I do have a quick hit on two players Chicago signed pretty early in free agency. Cameron Schilling is a 26-year-old defenseman who has skated six NHL games for the Capitals in the past three seasons. On the surface, he likely was signed as a solid blueline option for Rockford. However, Schilling was signed for two years; year two of the deal is of the one-way variety. Perhaps he is in the mix for a depth spot on the Hawks D.
Not likely in that boat is left wing Michael Liambas. 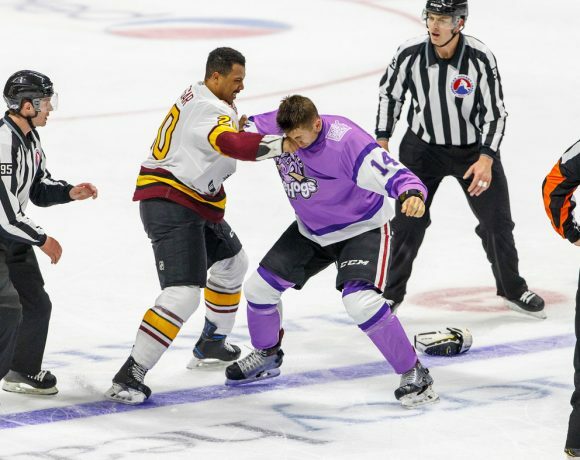 IceHogs fans will recognize him from numerous scuffles with Rockford skaters when Liambas was in Milwaukee the last three years. Liambas, who inked a one-year, two-way deal, provides penalty minutes and fisticuffs. 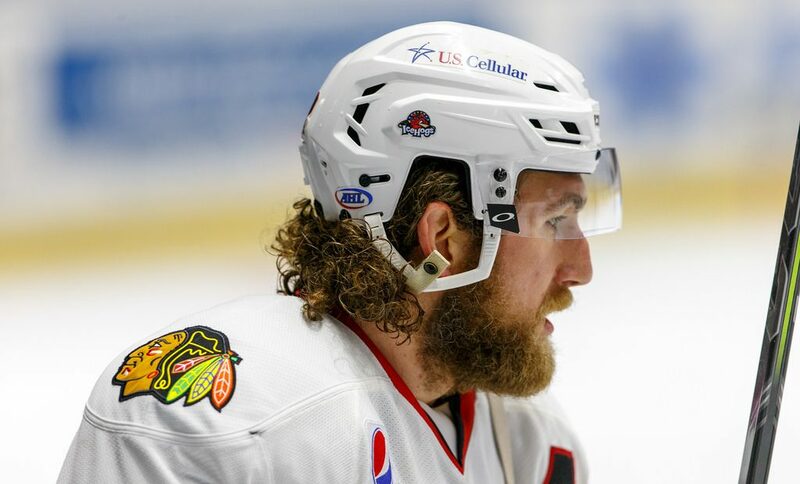 He is a rugged player who has tangled with several of his new Rockford teammates. The Liambas-Cody Bass rivalry can still continue with the players swapping sweaters. Liambas junior career was cut short after a lengthy suspension for an on-ice hit. He was suspended while playing college hockey in Canada and moved on to the ECHL. He was suspended three games in the AHL last January after an illegal hit. At 5’9″ and 190 pounds, the 26-year-old Liambas is on his first NHL contract. He doesn’t seem to have the puck skills to contend for a roster spot with the Blackhawks. He has a long history of suspensions in multiple leagues but someone must have wanted the guy in a Rockford uniform. I’m trying not to judge Liambas on his past transgressions but I have to admit I scratched my head a bit after I heard of the signing. We’ll soon see as to where he fits in the organization. Chris DeSousa-24-year-old free agent center, played with Indy Fuel after his college career with the University of Prince Edward Island was finished. Had 7G, 9A in 20 games last season for the Fuel. Daniel Ciampini-24, the forward was a Hobey Baker finalist at Union, where he played four seasons. 3G, 3A in 15 games with the Worchester Sharks late last season. Nick Mattson-Blackhawks sixth-round pick from 2010, the 6’1 defenseman, 23, signs with the Hogs after a four-year career at North Dakota. Mark Visentin-22-year-old free agent goalie signed to AHL deal. Former first-round pick of the Coyotes (2010). Missed all of last season following ankle surgery. AHL contracts that as of now have not been renewed include Jamie Wise, Ryan Schnell, Zach Miskovic and Keith Seabrook. With so many players under contract to the Blackhawks, it seems unlikely that Rockford will hand out many more AHL deals at this point. Most of the guys they have signed will be down in the ECHL with Indianapolis. If I see that the above guys have landed anywhere, I’ll try and tweet (@jonfromi if you care to follow) that info out. Again, I’ll put together a little more formal Rockford preview in a month or so.